This page groups all the tools that are available on this site. 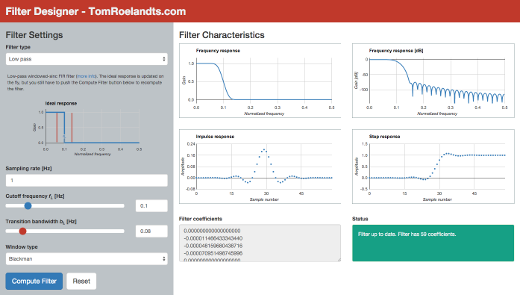 The Filter Designer implements the algorithms from the series of articles on low-pass, high-pass, and band-pass and band-reject filters. The latest version of the tool allows you to change the sampling rate away from the default of using normalized frequency (but beware of the caveats). You can also change the window from the default of Blackman. At this time, the tool is still limited to the (very basic) design method from the mentioned articles, so its main usefulness is still educational. 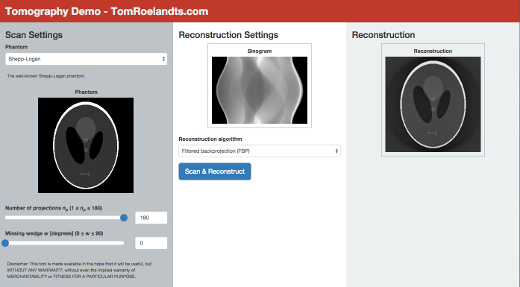 The Tomography Demo illustrates basic scanning and reconstruction as described in my series of articles on tomography. There are several phantoms to choose from, and the tool allows you to change the number of projections and to introduce a variable missing wedge of projections. Reconstruction is, for the time being, limited to classical filtered backprojection (FBP) and unfiltered backprojection. The QR Code Generator demonstrates the concepts from Color QR Codes Done Right. The Pinhole Size Calculator implements the formula that is introduced in Pinhole Photography.